All consolidation cell components are available individually for Humboldt's Fixed-Ring Consolidation, Floating-Ring Consolidation and Fixed-Ring Permeability cells. Just click on the part you need and specify the appropriate size required. Load pads for consolidation cells are available in sizes from 2.0" to 100mm. Upper stones for consolidation cells are available in sizes from 2.0" to 100mm. Lower stones for consolidation cells are available in sizes from 2.0" to 100mm. 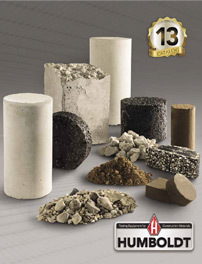 Lower stones (Fixed & Permeability) are available in sizes from 2.0" to 100mm. Acrylic Cylinders (Fixed) for consolidation cells are available in sizes from 2.0" to 100mm. Centering Rings (Floating) for consolidation cells are available in sizes from 2.0" to 100mm. Clamping Rings (Permeability) for consolidation cells are available in sizes from 2.0" to 100mm. Clamping Rings (Fixed) for consolidation cells are available in sizes from 2.0" to 100mm. Bases (Floating & Permeability) for consolidation cells are available in sizes from 2.0" to 100mm. Bases (Fixed) for consolidation cells are available in sizes from 2.0" to 100mm. Cutter Rings (all) for consolidation cells are available in sizes from 2.0" to 100mm. Lower O-rings (Floating & Permeability) are available in sizes from 2.0" to 100mm. Lower O-rings (Fixed) for consoldation cells are available in sizes from 2.0" to 100mm. Upper O-rings (Permeability) for consoldation cells are available in sizes from 2.0" to 100mm. Posts (all) for consoldation cells are available in sizes from 2.0" to 100mm. Locking Nuts (All) for consolidation cells are available in sizes from 2.0" to 100mm. Lifting Knobs (All) for consolidation cells are available in sizes from 2.0" to 100mm. Upper Port Connections for consolidation cells are available in sizes from 2.0" to 100mm. Lower Port Connections for consolidation cells are available in sizes from 2.0" to 100mm. Calibration disks for consolidation cells and shear boxes are available in sizes from 2.0" to 100mm.